Are you looking for the perfect Valentines present, or birthday present for a loved one? Or perhaps, you just want to surprise that special someone with a truly unique and romantic gift? 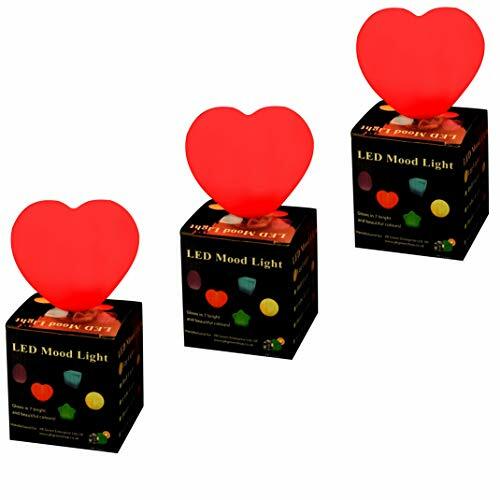 Whatever the occasion, our heart shaped LED colour changing lights are guaranteed to please. With their subtle, cross-fade colour sequencing, these heart lights bathe rooms and spaces in a pool of ever changing, gently blending colours, which are truly delightful to watch and provide the perfect talking point for family and friends alike. Or, if you prefer to set a particular mood, one flick of a switch, and you can freeze the colour of your choice. So, whether you want a romantic display of red for an intimate dinner for two, or a vibrant burst of pink for a wedding or anniversary, the choice is entirely up to you. Our LED colour changing lights are made of a soft, durable material, making them ideal for use around children as well as adults, and their easily replaceable batteries, with over 4-6 hours of continuous shine time, mean that your glowing heart is guaranteed to keep on giving a romantic shine to your life, time and time again. - Battery requirements: 3 x AG13 batteries in each light (included and already installed). 3 extra spare batteries also included with each light. All PK Green LED mood lights come in a glossy finish colour gift box. These LED mood lights are exclusively manufactured for PK Green - we hold design copyrights and exclusive worldwide distributor rights for this model of LED mood lights.